YARRAM - PORT ALBERT AND DISTRICT. The artist's strong interest in preserving our historic architecture, and his love of painting have combined to help preserve in oils, many of our country towns and streetscapes. Born in Yarram in country Victoria, he won his first award in 1967 when he awarded first prize for a painting of historic Port Albert at the Sale Festival of Arts. In 1971, Warren departed for London where he attended the City and Guilds Art School, studying painting and sculpture. Returning to Australia, he held his first solo exhibition at the Sale Regional Gallery. All his works sold at the exhibition. 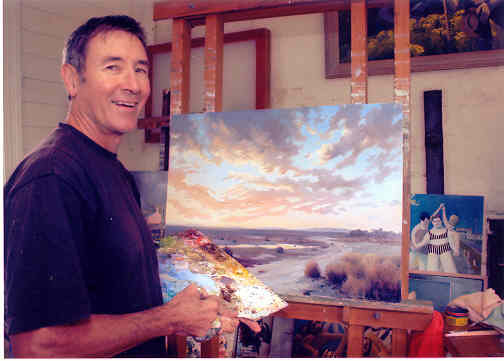 In 1978, Warren moved to Melbourne and concentrated full time on his painting. He was awarded the 1980 Camberwell Rotary Travel Study Grant and spent the next twelve months studying and painting in Europe. Warren Curry now lives and works in a studio in historic Port Albert in Gippsland, south-east Australia. He has won over thirty major art awards and numerous commendations; his work is represented in Commonwealth, Regional and Municipal collections, corporate boardrooms, government premises and private collections, many of these in England and the U.S.A. Port Albert, Victoria 3971, Australia.